Zork I: The Great Underground Empire was the first of three text adventure games by Infocom that were created by splitting the open-source mainframe text adventure, Zork, so that it could be released commercially on the personal computer hardware of the time. Zork I was later released for the Saturn and PlayStation with music, graphics, and sound effects. These versions were only released in Japan. It was one of the first adventure games created. It was created by MIT university students, Dave Lebling, Bruce Daniels, Marc Blank, and Tim Anderson, who had played Colossal Cave Adventure. 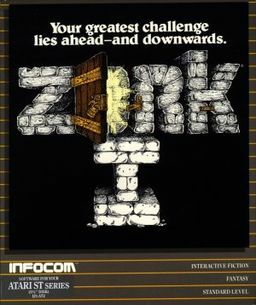 The game was originally called Zork before it was completed in 1978 when it was renamed Dungeon. The game was renamed back to Zork because the trademark holder of Dungeons & Dragons at the time, Tactical Studies Rules, claimed the game infringed on their intellectual property. In 1979, Dave Lebling, Marc Blank, and Tim Anderson formed Infocom. Mark Blank and another Infocom employee, Joel Berez convinced the founders that Zork could be sold commercially. In order for the game to be released on the many different personal computers available at the time, the duo designed a new programming language, "Zork Implementation Language", or ZIL, and which would run within a virtual machine entitled the Z-machine. Zork was split into three parts, Zork I: The Great Underground Empire, Zork II: The Wizard of Frobozz, and Zork III: The Dungeon Master, for microcomputers because they didn't have the memory available at the time to play the entire game.